Todd Haynes’ latest work, Carol, which premiered locally at the 2015 AFI FEST presented by Audi, was re-visited today at the Harmony Gold Theater in West Hollywood where several of the film’s artists convened to represent the film on a post-screening panel discussion with the audience. The panel was moderated by Debbie Elias, film critic, creator and host of the radio show, Behind the Lens. 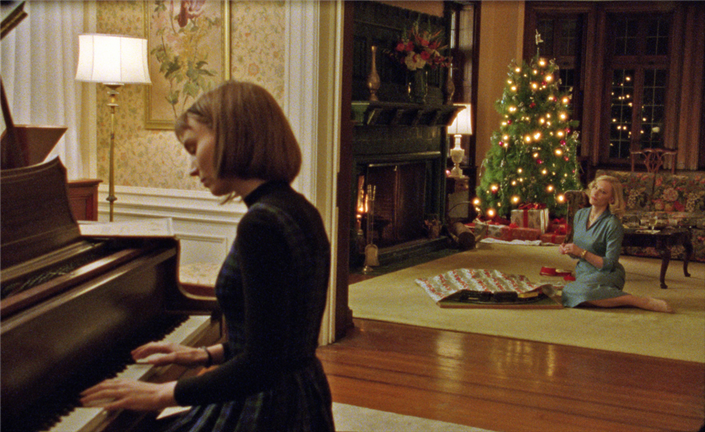 Carol’s themes make it an interesting companion to Haynes’ late-‘50s period piece, Far from Heaven (2002), a re-make of Douglas Sirk’s melodrama, All that Heaven Allows; however, the visuals of the two films work in opposite directions — Far from Heaven using an expressionistic, “high-Hollywood” style of saturated color and studio sets, and Carol employing a naturalistic, more muted, street-photography aesthetic. 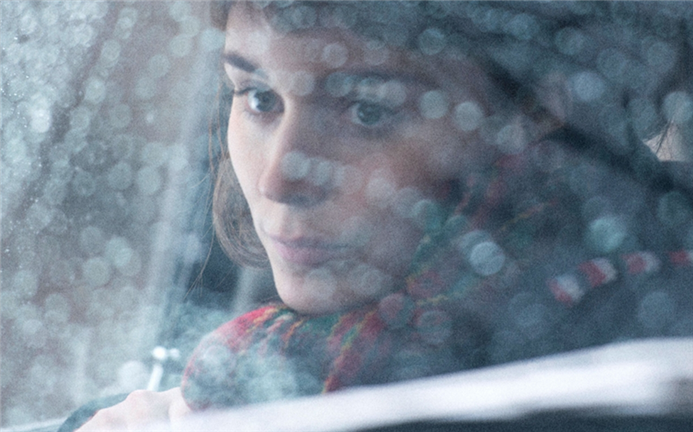 Carol’s images are often filtered, reflected, blurred, or obstructed, and the frame is often used to show boundaries or emotional states that include a sense of entrapment. 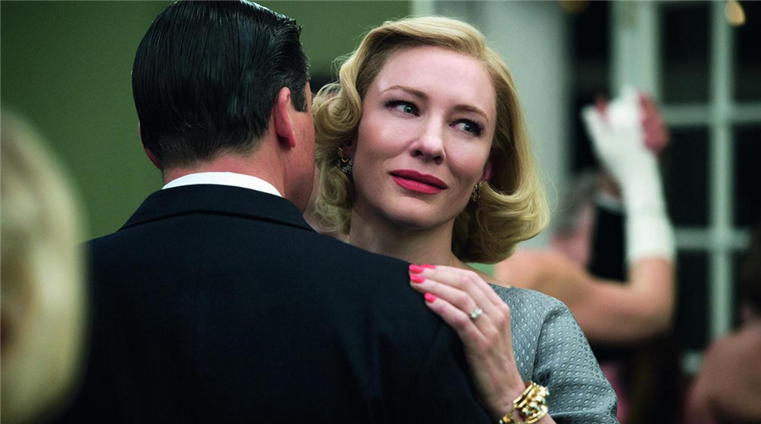 A love story about the social repression of desire as it buds, blossoms, and roots itself in the minds and hearts of two very different women, Carol portrays the attraction between Therese (Roooney Mara), a young department store clerk aspiring to be a photographer, and Carol (Cate Blanchett), a well-to-do wife and mother who in the end turns to consulting in furniture design. As they discover each other, they each bring themselves into sharper focus. In the process they meet head-on with the “morality-clause” legalities (and shady illegalities) of divorce and custody precedents in an era less open than today’s. The supremely sensitive and nuanced etching of Carol’s and Therese’s characters through their alternating points of view on each other and their world creates a suspenseful and uplifting journey for the audience to follow. The film begins at a crucial moment in their developing relationship and then immediately flashes back some months to the hustle-bustle of New York City at Christmas time and a chance meeting while shopping. 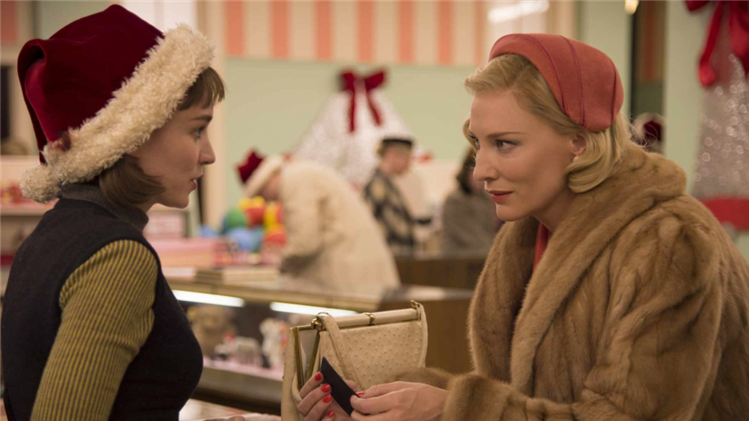 Carol, drenched in mink, asks for a doll for her daughter and Therese, behind the counter and donning a requisite Santa’s cap, recommends a toy train. “That’s that,” agrees Carol, the first of several times she utters her frank expression in the clipped but meaningful dialogue of the film. Luckily for Therese, Carol leaves her leather gloves behind…. Debbie Elias Would each of you tell us what brought you to work on the film, Carol? Phyllis Nagy I knew the author, Patricia Highsmith. The project came to me 18 years ago, and it was the first project anyone had ever hired me to write. It was a burden, because I felt so obligated to preserve her vision. I didn’t realize I had a right to a vision, too. I saw how faithful one could be to the work without being faithful at all. DE Why did you change Therese from a bohemian theatre designer to a photographer? PN One reason is that I come from the theatre but I’ve never seen an authentic rendition of the theatre on the screen. But most of all, it’s not so important that she be a theatre artist. Making her a photographer meant there was an instant connection with what she creates, and we’re seeing it on the screen. DE What about you, Ed? Ed Lachman The producer came to me about Carol, and I said, “Of course.” I only knew Strangers on a Train and The Talented Mr. Ripley from Highsmith's writing, but I’d actually worked on The American Friend. This film still encapsulated the concept of what a crime is. Love became the criminal act, and it opened up a whole new idea of how to film the subjective mind. EL We shot on 16mm because 35mm film today looks almost grainless, like digital photography. For this time period we didn’t want a cinema-high-saturated, LOOK magazine style of images. The period was dominated by women journalists — Ruth Orkin, Helen Levitt, and Esther Bubley — and Ektachrome slides, and women were working with color in a very limited, experimental way. So we thought, why not shoot in a lower format that would fit the austerity of the time period and lose the richness of the negative, but still capture the grain? You know, grain moves, giving an anthropomorphic feel to the film, as if something’s pulsing beneath the surface of the image. Super 16 went under the skin, to the emotions hiding there. DE What drew you to the project, Sandy? Sandy Powell The thing that struck me first was the color palette. Todd showed it in his Look Book that he gave each of us in the beginning of the production. 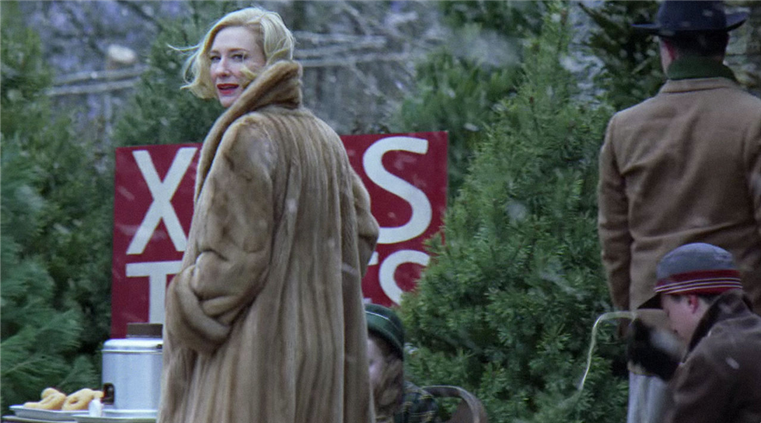 The colors were muted, but with a certain hi-light: a taxi cab, Carol’s red coat, a yellow and red beret on Therese. Carol was the only person in the film who could afford to wear clothes that were spot-on 1952 because she was a woman of means. Therese dressed for practicality and comfort, not to have lots of clothes, not to please her boyfriend. Abbie had confidence, and I used earthy colors for her, bolder, plaids, tweeds, and checks that showed she was high-society. DE Doesn’t costuming in film have its own narrative — a huge mosaic, an accumulation of details we note at the end? With Ed’s lensing through glass, it’s very subtle, not attention-seeking, but he creates, altogether, a very poetic visual grammar. SP All the credit goes to Todd. He’s the genius. He puts all these people together. It’s much easier to design for characters who are right there on the page. 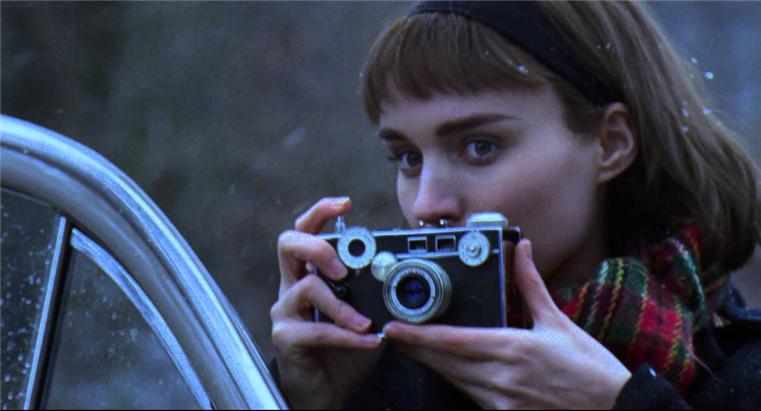 DE What is the magic of Todd Haynes? EL He allows a position of experimenting in the writing. There’s silence in the film, so Todd is very well versed in trusting images to tell the story. The writing is very short. The dialogue is simple. There’s the poetic editing of the tunnel. Todd strives to enter the interior world of the characters. SP It’s about taking risks and communication. Todd listens to people and welcomes collaboration in the true sense of the word. PN It’s very important not to lose sight of the tone and intention of the story you’re telling. Highsmith is idiosyncratic, a provocateur, forward-thinking regarding motherhood and what it means to be in love. A novel can be about plot, but drama needs emotional room to create subtext. It means finding a perspective that translates to cinema and not overloading it with psychology and so on. Highsmith allows this. EL The opening scene has lots of movement — it’s all in the looks. That creates a tension between the two women. We shot in a fabric store in Cincinnati that had a floor we could make over and it let us use the color palette we wanted, lending a certain grayness to the imagery, maybe a pale green and pink of the period just coming out of war. Early color film didn’t have a full color spectrum. Rather than the aesthetic of Todd’s Mildred Pearce, a high-cinema look of the classical Hollywood era of saturated color, we sought an alternative photographer’s point of view, look, and style for the image. SP Carol had to stand out from the crowd, so the book and the screenplay both said fur coat, luxury, but immediately I felt it had to be a light color, not a typical brown beaver like others. And it had to be the right length and right shape, to show some skirt, and some leg. A tailor made one for us from scraps of old fur, and it fell apart every day. But that image, with the coral scarf and hat, sets her apart. DE What did you find in the Look Book? SP Todd had put together a collection of paintings and photographs from the period — images from fashion magazines, articles with interesting bits of color, some Edward Hopper. DE How did you approach the special tone of the film and the time period, Ed? EL For filming through the glass we looked at Saul Leiter, a street photographer in New York who did abstract images. It was another way to show looking in at these characters looking out, to translate their emotions — the visual representation that’s also the psychological state of the characters. We see layers of emotional states at once. I used Cooke Speed Panchro lenses. Super 16 is already diffused, and shooting through windows and mirrors diffuses the image. Using 35mm lenses on 16mm format means I was using the center of the glass. And I tried to find older lenses to show the feeling of the time period. DE What about working with the actresses? SP Cate is so tall that 80% of her clothes had to be made just for her. Her shoes were made by Ferragamo, based on patterns from the ‘50s. The rest of the costumes were mostly from retro shops. PN I was concerned about how not to lose the entire audience — especially these days — over what Carol says in the lawyer’s office. The film is about the discovery of a desire. Carol doesn’t know exactly what she’s doing. And this is the scene where the audience must fall in love with Carol and not turn her into a Meryl Streep in Kramer vs. Kramer. And it’s also the scene of truth for Carol, when she says, I’m going to spirit myself off, and find out about me, and one day be good for my daughter. This scene is not in the novel. I also had to look at the character through the eyes of Harge and Richard, and then even Rindy — I think they love her. You have to identify with them, and as long as I make them human, it reads. Director: Todd Haynes; Screenplay: Phyllis Nagy, based on the novel The Price of Salt by Patricia Highsmith; Producers: Elizabeth Karlsen, Stephen Woolley, Christine Vachon; Cinematographer: Ed Lachman; Editor: Affonso Goncalves; Sound: Geoff Maxwell, Leslie Shatz; Music: Carter Burwell; Production Design: Judy Becker; Art Director: Jesse Rosenthal; Costume Design: Sandy Powell. Cast: Cate Blanchett, Rooney Mara, Sarah Paulson, Jake Lacy, John Magaro, Cory Michael Smith, Carrie Brownstein, Kevin Crowley, Nik Pajic, Kyle Chandler. Color, Super 16, 118 min In English.